In 1975 I met a man who had been a Castle Gap treasure hunter just a few years before. The method he used was as follows. After surveying the area and divining the likely spot for gold the be hidden, he and his brother would bore holes for dynamite charges to be placed. Since they were trespassing, the two would wait until midnight to set off the charge. The next days work would be to clear the rubble and look for traces of the gold and perhaps divine the location for the next charge. This went on for a month. Until they ran out of dynamite. Because of all the treasure seekers and the damage done, the original trail bed through the gap (above the wash) has been obliterated. The ruins of the two story Butterfield Stage station have long been returned to the earth. If you look at an early historical map of West Texas you will see that most trails heading west funnel through Castle Gap. Cabasa de Vaca passed through the gap in the late 1500's. The Comanche Trail to Mexico passed through the Gap. The necessity of surveying the region brought several parties to Castle Gap in 1849 and 1850, including those of John S. (Rip) Ford and Maj. Robert S. Neighbors in April 1849, Bvt. 1st Lt. Francis T. Bryan in July 1849, and John Russell Bartlett in October 1850. From 1858 to 1861 Butterfield Overland Mail stages passed through the gap twice a week on their 2,795-mile, twenty-five-day trips between Tipton, Missouri, and San Francisco California. The first stage traversed the pass on the night of September 25, 1858, en route to fresh mules at Horsehead Crossing. Horsehead Crossing, just west of Castle Gap was a natural ford on the Pecos river about 12 miles from the western mouth of Castle Gap. 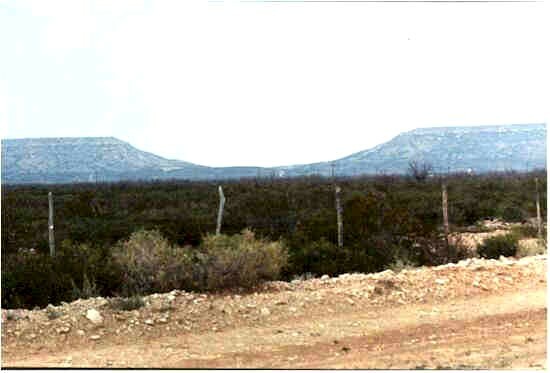 In 1864 William A. Peril drove the first cattle herd of any size through Castle Gap en route from the Hill Country to Chihuahua. The most noteworthy drive occurred in the spring of 1866, when Charles Goodnight, Oliver Loving, and eighteen men trailed 2,000 longhorn steers and breeding cows to Fort Sumner, New Mexico, from the Brazos in North Texas by way of the Middle Concho and Castle Gap. The drive opened up the Goodnight-Loving Trail for hundreds of succeeding drovers, who used the route as a springboard to push cattle as far north as Montana. The story of Charles Goodnight and Oliver loving was immortalized in Larry McMurtry's fictional book "Lonesome Dove". There are at least eight stories of lost gold in or around Castle Gap.You may think no one believes the stories of gold. If you think that, you are mistaken.Since the first gold story was retold around the campfire and later in the coffee shops, men have looked for the gold.From pick and shovels to dynamite and heavy equipment, the gold seekers have been seeking that elusive prize. Gold carried by Francisco Vásquez de Coronado in 1540. The Catholic Cross Cache of 1780. A horseshoe keg full of gold lost by a returning California Forty-niner. A Butterfield stage treasure hidden in 1860. A gold cached buried by Old Bill Castle and Little Bill Castle in the 1860's. Another $40,000 stashed by outlaws who preyed on passing wagoners. Gold and rifles from a United States Army wagon train of the late 1860's. The treasure of Mexican emperor Maximilian, stashed in 1867.